Four Winns of Cadillac, Michigan, builds a full complement of twenty-three models of family boats in five different series ranging from eighteen to over thirty-one feet plus sport yachts to over forty-three feet. The SL262 is the largest of the series of three “Sport Luxury” family boats ranging from twenty-two to this twenty-six and a half-footer. This relatively new SL series features Four Winns latest version of its patented Stable-Vee hull design called Cross Stream architecture. All SL’s are loaded with standard equipment and the SL262 tops them all. Notable standard equipment includes several choices of hull gelcoat colours and graphics, three choices of interior colours, a large, easily-accessed swim platform plus a bow platform, each with an integrated stainless steel boarding ladder and non-skid rubber matting, a power-assist swim platform lounge seat that converts to a sun lounge, snap-in cockpit carpeting, enclosed head with porta-potti, a portable 36-quart cooler, bimini top, transom shower, a tilting steering wheel with real wood rim, depth sounder with air and water temperature, iPOD/MP3 port with storage, Sony stereo and speakers, custom Sure-Load™ tandem axle trailer, and even a key chain remote control for the blue courtesy lights. There is probably more storage and seating flexibility built into the SL262 than most families would ever need, including a huge in-floor locker to accommodate watersport accessories and even a rear-facing spotter’s seat. Four Winns pays particular attention to seat construction, materials, sizing, and angles. Even with the extended list of standard equipment, there is a full choice of optional equipment available to personalize your boat. Choose from a range of upgraded stereo and tow sports packages plus snazzy hull graphics and canvas options. Inside, you can outfit your SL262 with navigation electronics, filler cushions, a cockpit table, upgraded head compartment, and even a cockpit heater. Your power choices of either Volvo Penta or MerCruiser sterndrives from 320 to 375 horsepower are available depending on your intended loading and watersport requirements. 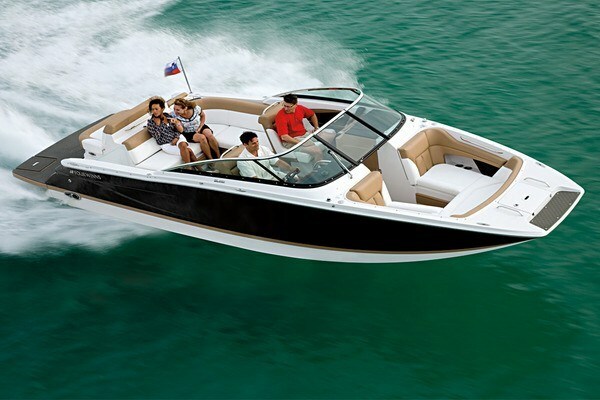 The SL262 is a comfortable and luxurious solution for the upscale buyer who likes lots of room with the flexibility to accommodate almost every family boating requirement.